We offer vertical blinds in a variety of patterns, textures, and colors. Vertical blinds give an illusion of increased space in the rooms they are installed in. 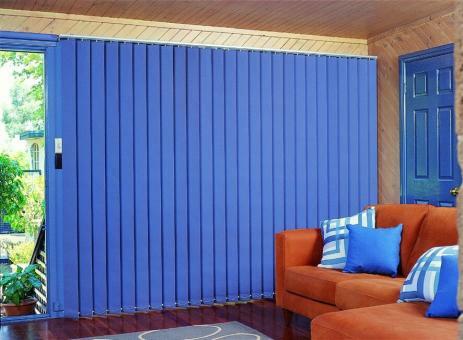 Vertical blinds are very efficient in minimizing heat gain or heat loss and offer excellent light control. The Ultimate Vertical Blind Collection offer a contemporary or traditional style that is perfect for large windows and sliding glass doors. Achieve excellent light control with a decorative selection of light filtering and room darkening louvers and fabrics. Vertical blinds are made with the best PVC and fabric materials. Resistant to moisture and corrosion, vertical blinds are easy to maintain, stay clean and are long lasting.